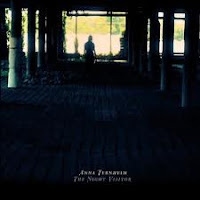 After netting a pair of Swedish Grammys with her last album Leaving On a Mayday, Anna Ternheim takes a new approach with her forthcoming record The Night Visitor (out June 5th). Apparently, Swedes have dropped their obsession with garage/punk rock and are now smitten with American roots music. Following in the footsteps of The Lion's Roar from fellow Swedes First Aid Kit, Ternheim takes her sound back to the bare bones and rebuilds it with strum and twang. The dense arrangements of the last album have given way to a more organic flow. You can almost hear your heartstrings being plucked on "Walking Aimlessly". A Celtic aura hovers over "Lorelie-Marie". Ternheim even breaks out a whistle worthy of a round-up on "God Don't Know". The most powerful track on the album is "The Longer the Waiting (The Sweeter the Kiss)". It's a stark, country duet crooned from the deepest recesses of the heart. Some well-placed strings keep The Night Visitor from being an all-out roots record. The perfect example is "What Remains", a track that backs a simple acoustic guitar and subdued vocals with strings. As one gets deeper into the album a yearning for more of the old Ternheim begins to grow stronger. Songs like "All Shadows" and "Dearest Dear" lose the listener. An injection of the intensity and moodiness from Leaving On a Mayday would be welcomed. Best tracks: "The Longer the Waiting (The Sweeter the Kiss)", "Walking Aimlessly"